Crypto N’ Kafe- Disrupting positively the African Cafe Industry and revolutionizing the coffee trade. There’s no “good morning” without a cup of coffee in your hand after you wake up. The coffee industry serves as the energy booster to each and every coffee lover and worker as well as businesses’ manpower to go the extra mile each and every day. But do you really know where the greatest quality coffee beans that you are sipping now come from? It is from the Africa. Their climate in addition to their rich and fertile soil makes the optimum medium for the coffee beans to grow and taste the best after coffee beans processing. But there was always this barrier that makes the coffee-rich African continent farmers poor or not even tasting their own finest product. Because the traders just give them little speck of profit margin to live by and innovate on their own or sell their own enterprise directly to those buyers who wants the finest coffee. This is where CNK or Crypto N’ Kafe goes in, A new proof of concept. Where tokenizing the cafe industry and making the trade of coffee beans go nearer to the right priced for the buyers so that the real people who farmed the coffee which are the farmers will benefit and no need of middlemen anymore. That’s 100% margin that African farmers really deserves. They do deserved it more than anyone else. Because of that, we could say that the vision of CNK is to make the coffee industry stable and sustainable as ever would. 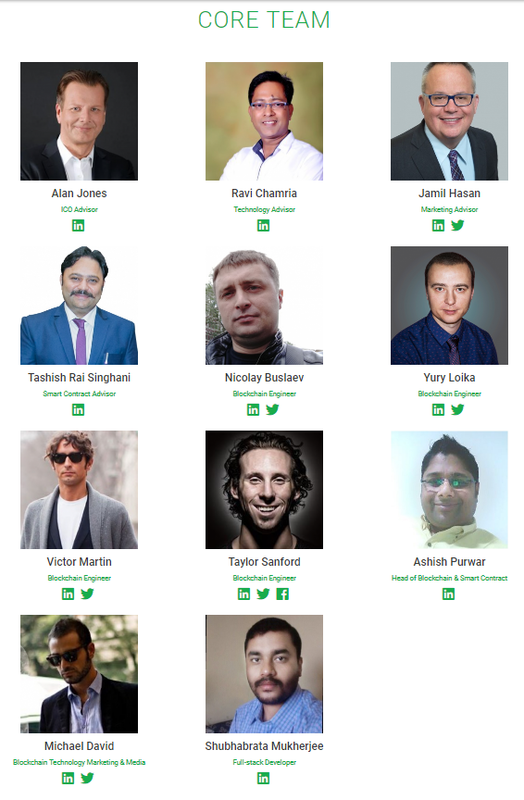 The core team of CNK has heart for the farmers, aside from getting the tokenization of the coffee industry, they want a ‘social connection’ to buyers as well as farmers in the industry. 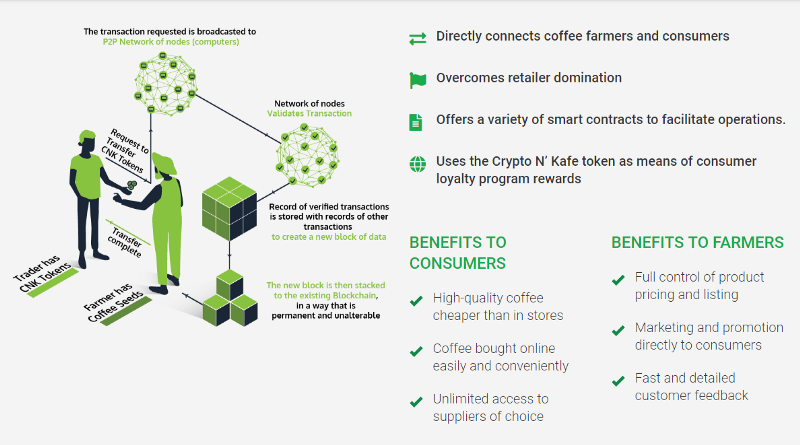 This shows the domino effect of the CNK token, with the control now of the price and they ‘know’ the price of the coffee bean products that they are selling, and the buyers know where to meet the farmers, they could meet and buy cheaper quality coffee because there are no more middlemen that puts markups on the prices. The smart contract under the Ethereum blockchain makes the transactions verified in not much time. Making the transaction secured, easily recorded and can be seen anywhere in the world. Paper-less transaction! An environment-friendly way to do business. It’s not only betweeen the farmers and consumers that has benefit. But also with the coffee roasters as well as distributors all over the world who will benefit from CNK token. A great deal for each and everyone. Including the token holders! Looking at their roadmap, by March 2018, they will be listed on Cryptopia and here’s the sweet progress, they will be listed at coinmarketcap.com by April. And as we all know, when it is in the coinmarketcap website, things get really exciting especially for us early adopters of CNK. 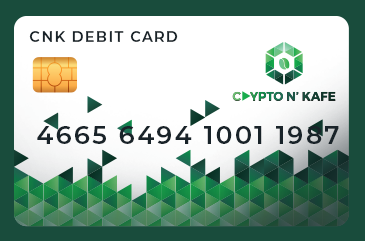 As far as I see also, There will be a CNK debit card! Then next will be the mobile apps for a portable wallet as well. A worldwide acceptance of funds that could be withdrawn to fiat! Great concept, vision and team! Super excited to have this coin and opportunity in front of us.